Last Friday I posted about the appeal of the cocktail. And for real, I had full intentions of working on a few of my new ideas this weekend including some seriously spiced up spritzers, but the pull from one of my favorite and most simple drinks won the day. I figured I’d simply hold off on the next post thinking you’d be bored with a repeat and the basic, but then again, wasn’t I just the person who was touting simplicity? 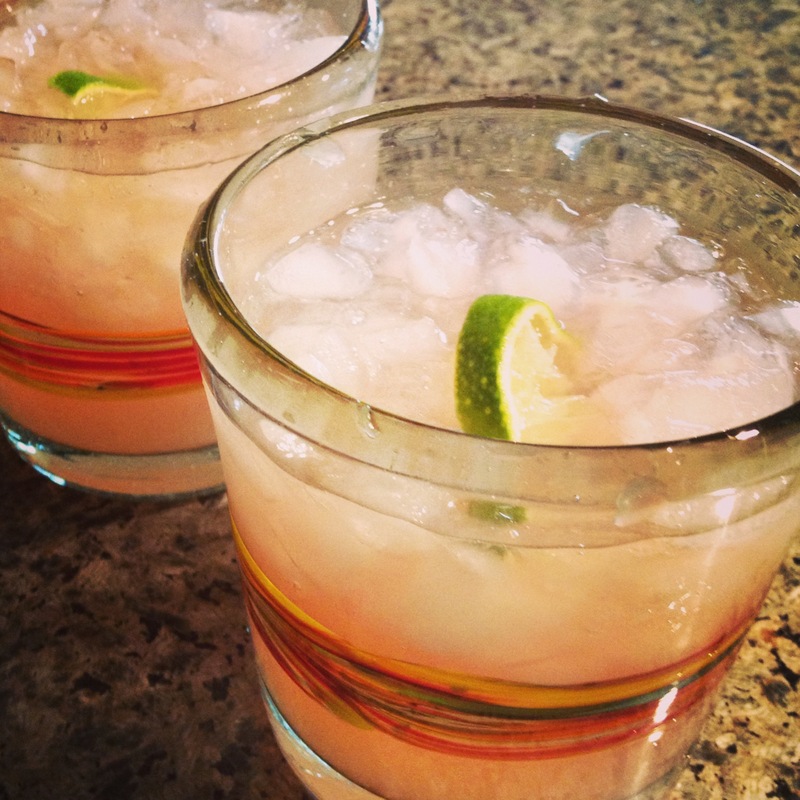 The Grapefruit Margarita is one of the most refreshing cocktails out there. It takes the bright and delicious standard and adds some serious freshness and bracing acidity. It’s great for a weekend brunch or a summer BBQ and is surprisingly impressive to share with your friends and family. You see, we all claim to love margaritas, but the majority of us drink terrible versions of the margarita the majority of the time. The tequila and orange liqueur should be highlighted with the citrus and the sweetness should be balanced, dare I say subtle. No sugar bombs please! Mix all of the above ingredients and pour over a rocks glass full of crushed ice. Yes, it’s that simple. But in honor of the classic, I thought I’d put together a little post about the cocktail. You know, the notion of the cocktail. Because when well executed the cocktail represents a confidence and an intrigue that no other drink can encompass. And most importantly, you can make your cocktail your own. Maybe you tweak a recipe, maybe you choose something historical or cutting-edge, but no matter what, having “your’ cocktail is a damn good feeling. What perfect timing then, that the folks over at Serious Drinks put together this list of 25 classic cocktails to get us all started. I’ll tell you, it’s a great list with a lot of great drinks; but encourage you to make these your own. Choose your favorite spirit and brand, choose your favorite garnish, and be sure to recognize the fun in choosing. Next week the Noblers are gathering for a little cocktail creation of our own and I bet we’ll have a few more options to report back on. So enjoy the weekend, at the Classic or not, and most importantly, enjoy a cocktail! It’s no wonder that when I first reached out to Adam Ford of Atsby Vermouth to set up a tasting for the Noblers, he offered to try to coordinate with the folks at Tuthilltown. After getting to meet Adam in person and try his two insanely delicious vermouths on Saturday, it’s clear he shares the passion and knowledge that make Tuthilltown and the spirit resurgence so exciting. Now you might be wondering, “Vermouth? Who the hell drinks that stuff?”. And if so you are not alone. In fact, up until recently, I myself had no real concept or appreciation for the history of this fortified wine and how through complacency and poor utilization, vermouth as a product had lost its way. You see, most of us know the stuff as that dusty bottle in our parents liquor cabinets used inconsistently and on a seriously limited basis. In fact, most of my experience with vermouth came from the bar at the French restaurant I worked at where vermouth was used to “flavor the glass” by pouring in and pouring out before a heavy dose of vodka or gin finished the job. Pair this with the fact that most folks don’t realize that vermouth, being the wine based spirit it is, goes bad, and goes bad a lot quicker than you’d think, and you’ve got yourself a pretty solid explanation for the lack of vermouth appreciation. So yes, if you or your parents have a bottle of 20-year-old open vermouth, it’s probably time to throw the crap out. In our tasting with Adam, he mentioned noticing many of these same observations. But after experiencing the peak of vermouth in his travels overseas, he came back with a plan to change these notions. Honoring the historical production of infusing botanicals into a mix of wine, brandy, and sweetener but upping the ante by starting with high-end nuanced products instead of the traditional bland wines and neutral spirits, Adam has created two modern-day vermouths, utilizing New York based sourcing to re-invigorate and create recognition for a truly delicious product category. 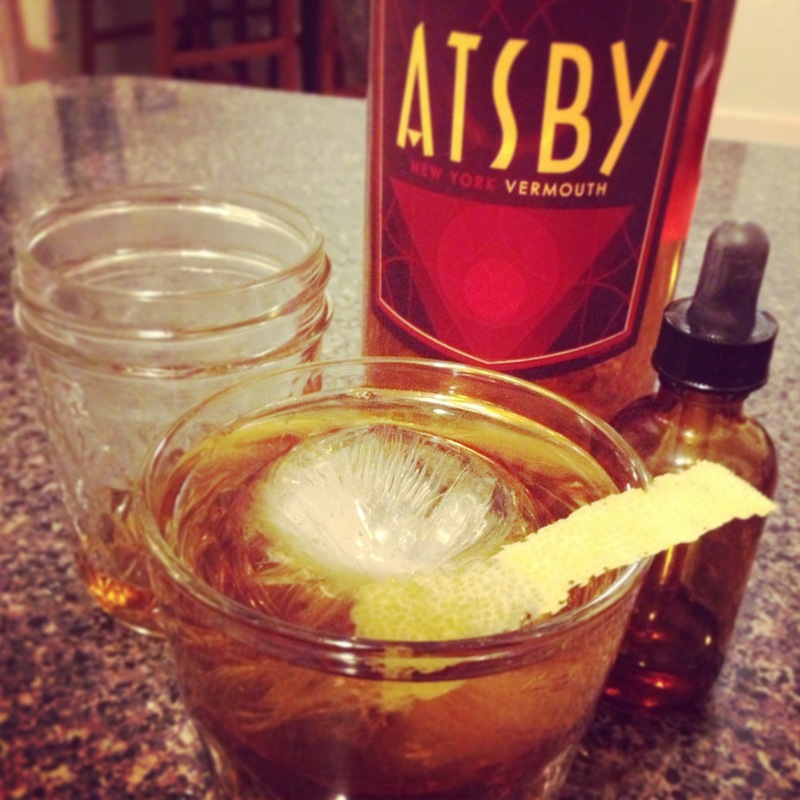 Atsby now has two vermouths on the market in its Amberthorn and Armadillo Cake varietals. Vermouths often come as “dry” or “sweet” but Adam took a more middle ground approach to make two delicious and versatile offerings. By leaning closer to the middle of “dry” and “sweet” for each of his products, the real distinction comes in the use of the many botanicals like French lavender in the Amberthorn and cardamom and shitake mushrooms in the Armadillo cake. Both were delicious but my preference for the Armadillo Cake probably stems from my preference for whiskey. The Armadillo Cake and Tuthilltown’s Hudson Manhattan Rye are a match made in heaven. I was excited to start experimenting with Atsby Vermouth in my own cocktail creation but last night, I decided to start with a classic. The Manhattan is by far one of the most famous whiskey based cocktails out there and while it might be simple in execution, the utilization of specific products is where the flavors can really take off. So being a bit inspired by Adam’s passion, I decided to use my own homemade spirits to make my version of the perfect Manhattan. 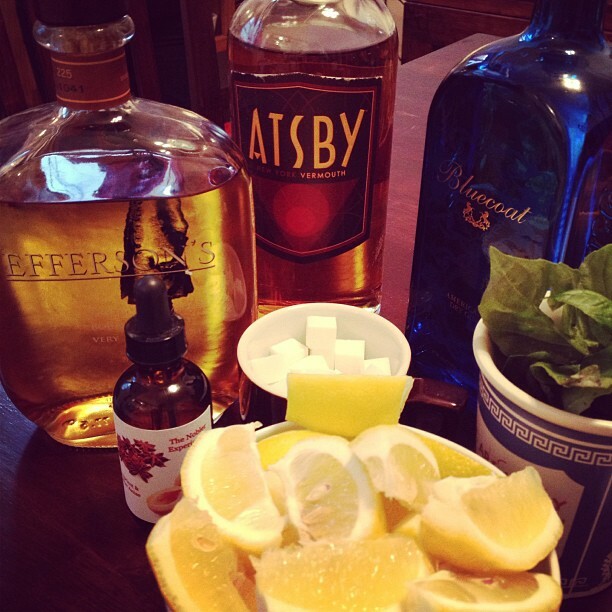 Make sure you pick up a bottle of Atsby Vermouth and enjoy this delicious cocktail! Stir the bourbon, vermouth, and bitters in a whiskey glass. Add one large ice cube and garnish with the lemon rind. The classic recipes call for a maraschino cherry and an orange wedge but I prefer my drink a bit less fruity. Enjoy! We had a glimpse of spring earlier this week so despite the crappy weather outside, I’m rolling with sunny evenings filled with refreshing cocktails for now on. 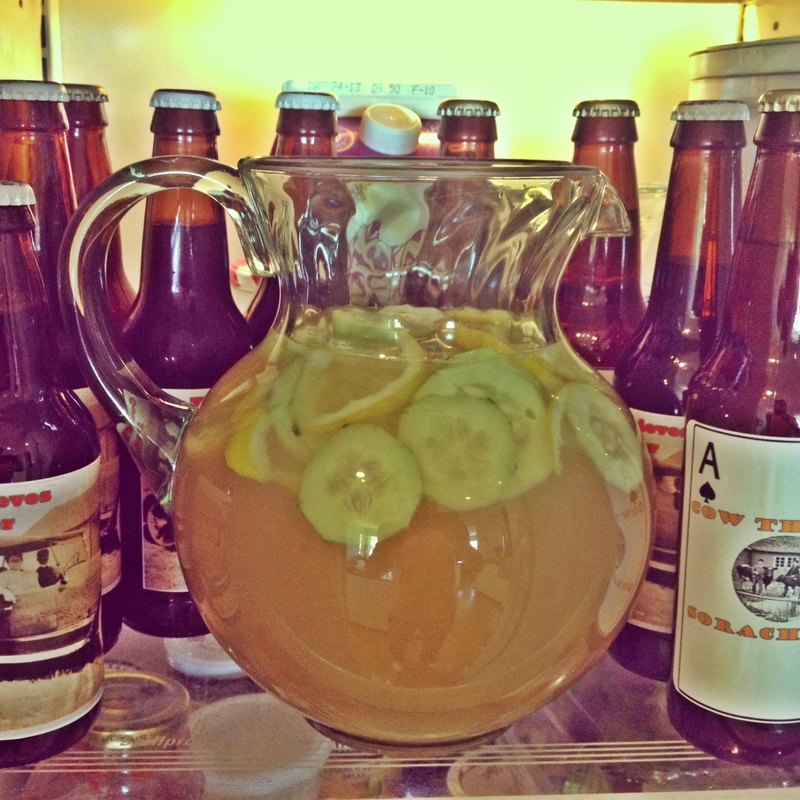 I don’t care if it’s pouring outside either, it’s outdoor drinking season in my mind, so who’s with me? 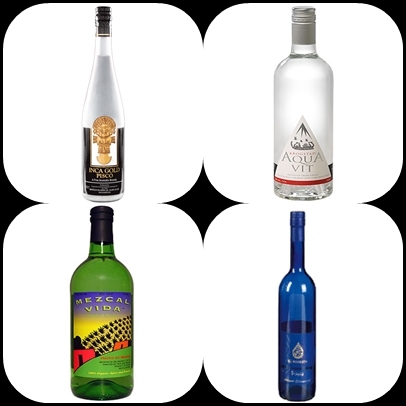 So with the season swapping agreed upon, I’m eying up a few new purchases to refresh our liquor collection a bit. And I’m asking you all for some help. I’ve got room for one more bottle (yes, we have a seriously intense liquor collection) so I’m leaving it up to you all to decide what I buy. Of course, with that comes a series of spring related cocktail recipes coming soon so it’s like choose your own adventure…and who doesn’t love a little choose your own adventure. Oh, and you need another reason to spend that little extra clicking energy to cast your vote. If you get in on the action, you are automatically qualified for the next Nobler giveaway contest starting next week with a bottle of my latest batch of bitters as the winner’s prize! Happy Spring everyone! One of the mainstays of a traditional Passover Sedar is charoset, a sweet fruit and nut “chutney” meant to symbolize the mortar used by the Israelites enslaved in Ancient Egypt (I know, pretty heavy stuff for a Monday). It’s actually a pretty simple yet often variable mix of dried fruit, apples, cinnamon, nuts, and red wine and while I’ve never been charoset’s biggest fan, it was the perfect canvas for my first ever Passover inspired cocktail. I swapped out the wine for bourbon because well, I love bourbon. And honestly, you don’t need to be taking part in Passover festivities to enjoy this guy. It’s really delicious and a great balance of sweetness and acidity. Plus you end up with delicious sugary walnuts for snacking in the progress. And it’s strong, so whatever you do, don’t leave this out for Elijah as he might not make it to the next home. One small issue: I’m pretty sure you aren’t supposed to drink bourbon on passover so, um, yeah….not sure how to help you with that one. Early afternoon cocktail before the holiday starts? 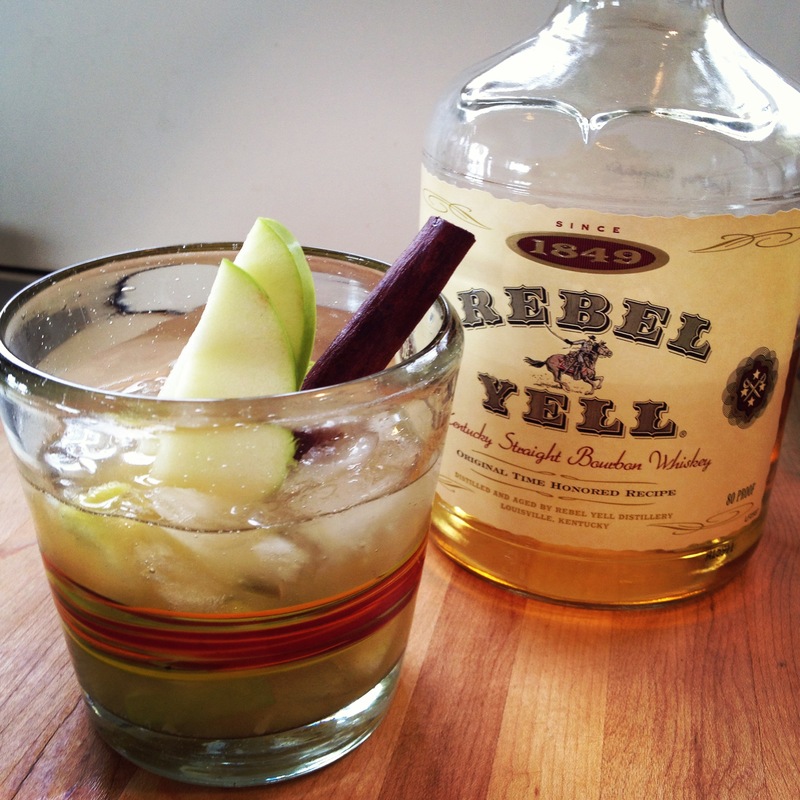 In a rocks glass muddle the apple slices with the bourbon. Add the cinnamon walnut syrup and the juice from the lemon wedge and fill with crushed ice. Pour into a pint glass and then back into the rocks glass to serve. Garnish with apple slices and cinnamon stick. In a sauce pan, bring the sugar and water to a boil. Add the remaining ingredients and reduce the heat to med and simmer for 5 minutes. Remove the cinnamon sticks and simmer on low for another 10 minutes. Cool before using. Serve the walnuts as snacks along side of the cocktails! You are currently browsing the archives for the Cocktail Recipes category.